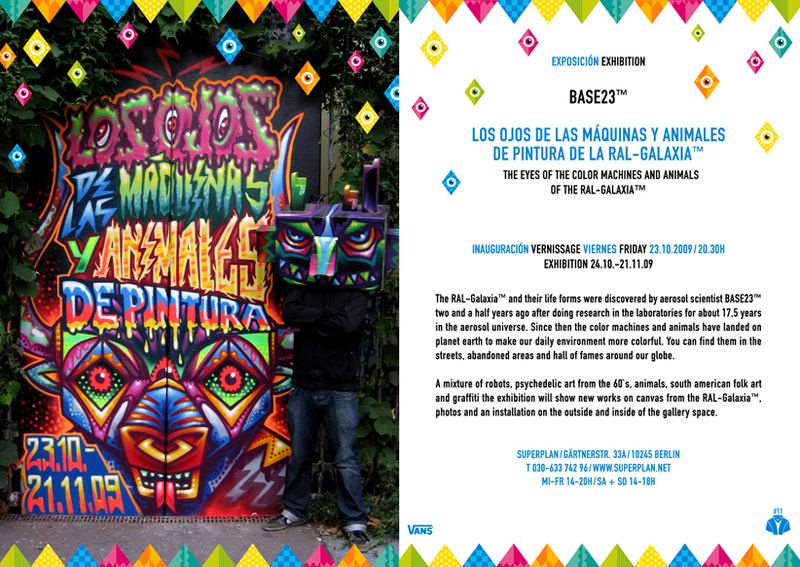 A mixture of robots, psychedelic art from the 60`s, animals, south american folk art and graffiti the exhibition will show new works on canvas from the RAL-Galaxia™, photos and an installation on the outside and inside of the gallery space. The RAL-Galaxia™ and their life forms were discovered by aerosol scientist BASE23™ two and a half years ago after doing research in the laboratories for about 17,5 years in the aerosol universe. Since then the color machines and animals have landed on planet earth to make our daily environment more colorful. You can find them in the streets, abandoned areas and hall of fames around our globe.